Mammals: In Finland White-tailed Sea Eagles rarely take mammals and then usually as carrion (dead sheep, seals). In Norway, not a single case of Sea Eagles attacking or killing reindeer/ reindeer calves, sheep/lambs, or goats/goat kids has ever been confirmed. Willgohs examined 540 prey remains among which were only four remnants of sheep. However, even these may have been scavenged rather that the result of predation. Despite some 2 million sheep and 3,000 breeding pairs of sea eagles in Norway no one has documented a lamb being taken as prey. Sea eagles occasionally breed less than 250m from inhabited houses and close to sheep farms and are looked on favourably by sheep farmers (eagles remove dead animals and reduce disease risk while competing with foxes and crows for carrion). Likewise, mammals made up only 3% of prey remains at nests in Germany. However, sea eagles have been documented to prey on lambs to some extent on lambs on the Isle of Mull, Scotland. An investigation of the diet of 11 pairs of sea eagles in 1999 and 2000 found that most pairs took few lambs but one pair took twice as many as any other pair. One pair may have predated 13 (62%) of 21 lambs diagnosed in 1999 but only four (21%) of 19 diagnosed in 2000 while the other intensively studied pair predated only one (9%) lamb diagnosed in 1999. The authors conclude that “even if we consider the worst case, i.e., that another two pairs of eagles on Mull killed as many lambs as did pair A (the worst pair), …the number of lambs killed annually on the island amounted to ‘tens’”. With “over 20,000 breeding ewes on Mull and total lamb losses… in excess of 13 per 100 breeding ewes” (2,600 lamb losses per annum), the losses attributable to eagles are small (c1-2%). 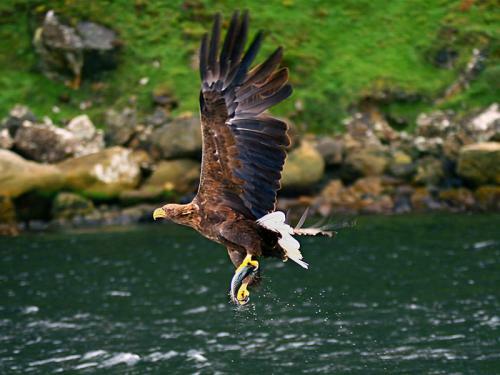 Expert opinion and experience from Norway suggests that even the few lambs that have been attributed to sea eagle predation on Mull may have been killed by other predators and subsequently found dead and scavenged by sea eagles. It is also unknown what proportion of the few lambs taken by sea eagles would have survived as there is evidence that other predators tend to take weak individuals, many of which are likely to die shortly after anyway.